I moved to Egypt a week before January 25, 2011, the start of a youth-led, pro-democracy uprising that toppled the regime of Hosni Mubarak after 30 years of authoritarian rule. Some call these events, which are far from concluded, a mere popular revolt. Others insist they are the beginning of a full-blown Egyptian revolution. Whatever future historians may conclude about the events that began on January 25, for me this truly has been a second revolution. The first, which seemed equally earthshaking at the time, took place at Columbia in April 1968. Then a junior, I joined numerous classmates in the occupation of Fayerweather Hall, was arrested in the campus-wide bust on April 30 and spent a night in the Tombs. This time an observer, as I watched events unfold in Egypt I often recalled the mix of euphoria and anxiety that I felt at Columbia more than 40 years ago. This article is based on a series of emailed dispatches to family, friends and former colleagues that began at the height of the crisis — as soon as the Mubarak regime ended its unprecedented five-day shutdown of email, cell phone and text messaging services — and continued through the Arab Spring. 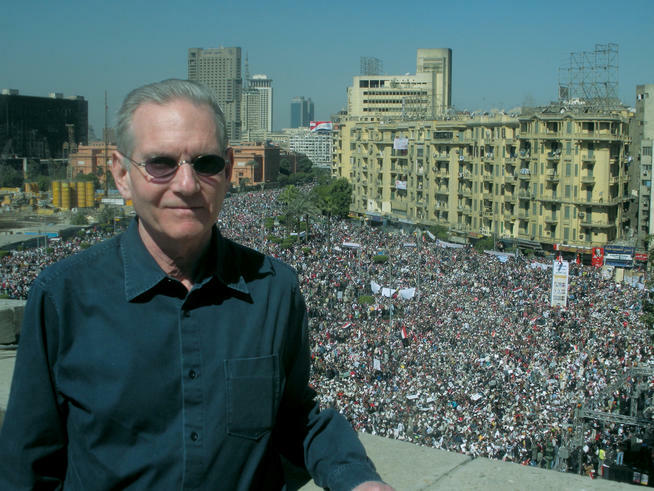 Marc Rauch ’69 stands atop the fifth story roof of the AUC Science Building, which fronts directly on Tahrir Square, where a crowd estimated at more than one million gathered on “Victory Friday,” February 18. I came to Egypt to be with my wife, Lisa Anderson ['76 SIPA, '81 GSAS], who had been appointed president of the American University in Cairo (AUC) effective January 1, 2011. From 1997–2007 Lisa had been dean of the School of International and Public Affairs at Columbia. She had served as provost at AUC since 2008 and also studied there briefly in the 1970s. The Tuesday following my arrival, January 25, was Police Day, a national holiday. Word spread that a demonstration had been planned in Tahrir (Liberation) Square, in the heart of downtown Cairo, to protest the torture and killing of a young dissident by the police in Alexandria. Although political protests, labor strikes and football riots had occurred in Egypt in recent years despite brutal government crackdowns, the massive turnout in Tahrir Square on Police Day was completely unexpected. Many of the demonstrators refused to leave Tahrir Square, and in the ensuing days, reports filtered back of skirmishes between police and protesters. Though tension clearly was building in Cairo, our leafy, upper-middle-class neighborhood of Ma'adi, where the AUC president's villa is located a 25-minute drive from downtown, remained serene. Friday, January 28, was declared a "Day of Rage" by the anti-government protestors. Any illusion that Ma'adi was a safe haven from the troubles downtown was quickly shattered after an afternoon of pitched battles between protestors and Mubarak's riot police in Cairo, broadcast live by Al-Jazeera. As darkness fell, automatic weapons fire began reverberating through Ma'adi as well. AUC provides good security at the president's villa and it was reinforced almost as soon as the shooting started, but the guards are not armed. My wife is famous in our family for being able to sleep through anything and she proved that night that she can even sleep through nearby gun battles. As for me, I lay awake all night trying to determine exactly where the gunfire was coming from and whether it was getting any closer. Thankfully it was not. Shortly before dawn on Saturday, five teeth-rattling concussion grenades exploded — Boom! Boom! Boom! Boom! Boom! Then the gunfire stopped. Dawn broke with a brief rain shower (infrequent in Cairo), birds singing and the acrid smell of spent gunpowder in the air. It turned out that during the night, demonstrators had attacked the Ma'adi police station mere blocks from our villa. Numerous police stations throughout Egypt were attacked and burned that night, leaving nothing but burned-out shells, but in Ma'adi the police fought off the demonstrators — this being the source of much of the gunfire. That morning I decided to introduce myself to the neighbors on our block of Road 19 in Ma'adi. I had been meaning to do so in any event, and a night of gunfire seemed as good an excuse as any. We exchanged landline numbers (the Mubarak regime had disabled all email, cell phones and text messaging services the day before) and agreed to coordinate if things got worse and we had to leave our homes in a hurry. By mid-morning it became apparent that the police (much-hated in Egypt) had disappeared from Ma'adi, and for that matter, from most of Egypt. Rumors circulated that the despised Minister of the Interior, Habib al-Adly (now serving a 12-year jail term for corruption and being tried on capital charges for shootings of peaceful protestors), had pulled the police and opened the jail doors in a desperate move to frighten ordinary people into supporting the Mubarak regime. As the day wore on, fears mounted that the "thugs" (in Arabic, baltagia) loosed from prisons by al-Adly were now roaming the streets of Cairo, breaking and entering, looting and burning. By late afternoon, makeshift barricades began appearing at intersections throughout Ma'adi (and throughout Cairo) in an effort to prevent thugs in stolen vehicles from entering the neighborhood. By nightfall, groups of civilians, many of whom had never met, took up positions at the barricades, armed with baseball bats, golf clubs, improvised spears and antique swords. Shortly before midnight, the armed forces — unlike the police, a respected institution in Egypt — emerged from their barracks to restore order in Cairo. Sand-colored tanks took up positions on major thoroughfares in and around Ma'adi and soldiers in camouflage set up checkpoints at strategic intersections, much to the relief of Egyptians and foreigners alike. Thus began a delicate, 10-day dance of confrontation and negotiation among the Mubarak regime, opposition groups, the armed forces, protestors occupying Tahrir Square and the U.S. government (whose pronouncements seemed to change almost daily), culminating in Mubarak's resignation on February 11. Meanwhile, during the several hours each day when the armed forces lifted its curfew, my wife convened AUC's emergency management team in the dining room of our villa (often to the sound of distant gunfire, and on one occasion with boisterous pro-Mubarak demonstrators marching through the streets of Ma'adi), making plans to reopen the university as quickly as possible and attending to the safety and security of faculty, students, staff and the university's campuses. Each long February night, as the fate of the Mubarak regime and the Egyptian people seemed to hang in the balance, neighbors helping neighbors lit bonfires, bundled up against the chill and manned barricades from dusk to dawn to secure our neighborhood of Ma'adi, just as they did to secure neighborhoods throughout Cairo. Egypt does not have a deep tradition of volunteerism and civic association as in the United States, yet from the chaos and panic of the early days of the revolution had emerged a remarkable display of citizenship and solidarity. The young activists who toppled the Mubarak regime called for a mass victory celebration a week later in Tahrir Square. An AUC presidential intern who had spent time in Tahrir proposed that we "check out the Square," and, escorted by a trusted AUC driver, we arrived in the center of Cairo shortly before noon. The streets were crowded with men, women and children streaming toward the Square and carrying banners, sacks of food and even folding chairs. Our driver managed to find a place to stop only a block from the square, near an entrance to AUC's Tahrir Square campus. Putting aside my qualms, I passed through a military checkpoint with the intern, and almost immediately we were surrounded by excited, jostling Egyptians anxious to make their way into the Square proper, a nearly impossible objective given the crush of people. The sensation was not unlike being caught in a riptide; we soon gave up and left the throng, much to my secret relief, though the mood of the crowd seemed celebratory, even jubilant, rather than threatening. Once back through the checkpoint, we proceeded to the fifth-story roof of the AUC Science Building, which fronts directly on Tahrir Square and often had served as a backdrop for television coverage of the revolution. Tahrir Square is a vast and somewhat irregularly shaped public space, once the military encampment and parade ground of Ottoman and British rulers of Egypt. Spread out before us as we reached the edge of the roof of the Science Building, and filling every nook and cranny of the Square as far as the eye could see, was an almost unimaginable sea of people, many thrusting aloft banners and waving red, white and black Egyptian flags. According to the next day's report in The New York Times, at that moment more than one million people were gathered in Tahrir Square. For me, the awe-inspiring effect of this multitude was similar to my first view of the Grand Canyon: It was hard to believe that such a thing could exist on this earth. Periodically, chanted slogans ("Our house must be cleaned totally!" i.e. "All cabinet ministers must be replaced now!") rose from the Square in thunderous waves of sound. Though billed as a joyous celebration, this demonstration was also plainly intended as a display of raw political power, a potent reminder to the Supreme Council of the Armed Forces (which had taken control of the Egyptian government a week earlier) that the popular movement that toppled Mubarak was not to be trifled with. We left the Science Building roof in stunned silence and made our way home from Tahrir Square. But the image of the vast flag-waving, banner-wielding, slogan-chanting multitude stayed with me, an image alternately inspirational and terrifying. Wildly optimistic and wildly pessimistic precedents — Gandhi's India, Mao's China — coursed through my mind, but surely it was the first time that I had begun to comprehend the magnitude of the forces unleashed by the recent events in Egypt. What’s in a Name, if It’s H.E. Suzanne Mubarak? Through a combination of foresight, courage and luck, my wife and her senior managers managed to reopen the university a mere 36 hours after the collapse of the Mubarak regime. The next weeks were full of uncertainty — AUC was the only university open in Egypt for nearly a month. Almost immediately, however, a controversy erupted at AUC that is still not definitively resolved. Tucked away in a corner of AUC's stunning New Cairo campus is a ground-floor lecture hall that seats about 70 people and is typically used for guest lectures. It was named the "H.E. Suzanne Mubarak Conference Center" after the wife of the deposed Egyptian president. The "H.E." stands for "Her Excellency." Mrs. Mubarak is a proud alumna of AUC. The naming of this modest facility in her honor by her friends and admirers was in recognition not of a specific benefaction but of her loyalty to the university through the years. Soon after the university reopened, an open forum was held in the largest auditorium on the New Cairo campus. Hundreds of students, faculty and staff attended in a scene uncannily reminiscent of the plenary strike meetings at Columbia in May 1968. Emotions in the AUC auditorium ran high, and speaker after speaker demanded the immediate removal of Mrs. Mubarak's name from the conference center, to general applause, loud cheering and stamping of feet. Toward the end of the forum, however, one young woman suggested that the university not act in haste and that at the very least the removal of Mrs. Mubarak's name be given further reflection. In the weeks that followed, the Mubarak name was removed from hundreds of public buildings in Egypt. I visited one of those buildings, an enormous state-of-the-art public library in a mixed-income area bordering our neighborhood of Ma'adi. Mrs. Mubarak was known for causing libraries to be built all over Egypt, a country where 30 percent of the population is still illiterate. I confess to having felt a twinge of doubt upon seeing that her name, once in huge block letters, had been wiped unceremoniously from the façade of this magnificent facility, open to rich and poor alike. Certainly the motives of those who want to remove the Mubarak name must be respected. The most frequently heard objection to name-changing is that it smacks of Stalinist rewriting of history, but these are not people attempting to erase the collective memories of their own ghastly deeds; they are pro-democracy activists affronted by reminders of 30 years of brutal dictatorship. Nor should those who favor retaining some version of the Mubarak name for historical transparency be overly rigid in their stance: Even those who feel most hesitant about removing Mrs. Mubarak's name — I count myself among them — would likely agree that the H.E. (Her Excellency) should go because it is a blatant provocation. Admittedly, it is not easy to make an "innocent spouse" defense on Mrs. Mubarak's behalf. While it is doubtful that blatant election-rigging, pervasive corruption and condoning of torture were routinely discussed at the Mubarak dinner table, even Mrs. Mubarak has since conceded that millions of dollars not properly belonging to her were found in her personal bank accounts. AUC is a private institution that makes its own decisions about such matters. Almost as soon as the university reopened, a list-serve was formed by students, faculty, alumni and interested outsiders for the sole purpose of bringing about the removal of Mrs. Mubarak's name from the conference center. One possible solution to the naming dilemma may be found at the University of Cape Town, South Africa. There, a prominent statue of Cecil Rhodes, the great explorer and statesman and notorious white supremacist, frames (some would say ruins) the view of the beautiful city of Cape Town and its picturesque harbor from the university's mountainside campus. Attached to the base of the statue is a plaque that reads something like this: We know that this statue will offend many people. Cecil Rhodes was a champion of the now-discredited system of apartheid. Yet Rhodes donated the land for this university — without him it would not exist — and he is part of our history. We have decided to leave the statue here in the hope that it will provoke continuing discussion. Rashid Khalidi, the Edward Said Professor of Modern Arab Studies and Literature at Columbia, visited AUC a few weeks after the Mubarak regime fell to give a talk on the new Egypt. He suggested still another approach. The first question following his prepared remarks came from a young woman, visibly shaking with anger, who demanded to know if it was proper for the university to continue to name a conference center after the wife of a deposed dictator. After acknowledging that he was indeed grateful for not having been assigned to speak at the "Suzanne Mubarak" center, Khalidi opined that it could make sense to rename the facility, but install a plaque reading "Formerly the Suzanne Mubarak Conference Center." Not long after Khalidi spoke at AUC, a recent graduate of the university, now a well-known political activist, pulled the gray stone plaque bearing Suzanne Mubarak's name off the wall next to the entrance of the conference center. As a veteran of Columbia '68, where students and their sympathizers thought nothing of occupying entire buildings and (in some instances) barricading entrances against the police, I had continued to be amazed at the civility on the AUC campus, where until that moment, and despite the continuing strong feelings about the Mubarak naming issue, students and activists had resisted crossing the line between peaceful, if lively, protest and damaging property. Plaque or no plaque, the conference center still remained officially named for Suzanne Mubarak. In late April, however, the university administration announced that use of the Mubarak name for the conference center would be suspended until the fall, when an international conference will be held at AUC on "Public Names, History and Memory in Political Transitions." Invited to the conference will be scholars and activists from post-apartheid South Africa, post-Communist Eastern Europe and post-dictatorship Latin America. The international conference, the university's announcement noted, will honor both the sentiment of the AUC community and the university's mission as an institution of reflection, debate and learning. Only following the conference, the announcement added, will a final decision be made as to the name of the conference center. Marc Rauch ’69 graduated from Harvard Law School in 1975. Prior to moving to Egypt in January, he practiced law in New York City for 35 years, first as a labor and entertainment lawyer, then in commercial real estate. From 2003–10 he also served in various positions in New York City government relating to affordable housing, the United Nations and sustainability.